Navigation: Home » Cancer Policy Blog » Health Care Roundup: With the Midterms Behind Us, What’s Next For Health Care? Health Care Roundup: With the Midterms Behind Us, What’s Next For Health Care? In order to bring you the latest cancer-related health care policy and news, we at NCCS combined our ACA Updates and What Caught Our Eye (WCOE) content into a weekly email and blog post. We aim to make this a concise, one-stop summary of what you need to know as we continue working together to make cancer care better for everyone. Your feedback is always welcome to make our content more useful to you. Please send comments to feedback@canceradvocacy.org. Technically, the midterm elections are behind us. However, with nearly 60 new Representatives ready to join Congress, NCCS continues to analyze the results and identify what opportunities and challenges may lie ahead for cancer care. To start, with the House now in Democratic control, the threat of legislative repeal of the Affordable Care Act (ACA) is likely off the table after two years of repeated attempts to gut the law. At a news conference this week, Senate Majority Leader Mitch McConnell rejected the possibility that Obamacare repeal will return to the legislative agenda, saying it is "very obvious" the Democrats would not be interested in repealing the law. He said Congress will now turn toward finding bipartisan solutions on the rising cost of prescription drugs. However, while legislative repeal of the ACA is now unlikely, we anticipate continued attempts to chip away at the ACA through the regulatory process. As we reported just last week, the administration released new guidance that would allow states to sell junk insurance plans and permit ACA subsidies to pay for these plans. All indications point to the fact that the Department of Health and Human Services (HHS) will be lenient in approving state waivers to further weaken and reduce access and affordability to patients in certain states. Another result of the midterm elections was the expansion of Medicaid in Utah, Idaho, and Nebraska, giving health coverage to 325,000 people and bringing the total number of states to expand under the ACA to 37. Democrat Janet Mills won the governor’s seat in Maine, where Medicaid expansion passed on a ballot measure in 2017, only to be stalled because the current governor flatly refused to approve implementation. So that state is also expected to expand Medicaid. Speaking of regulatory policy, this week HHS Secretary Alex Azar announced that the Centers for Medicare and Medicaid Services (CMS) plans to release a new mandatory Medicare payment model for cancer patients. The model will focus on radiation oncology, but no other details are known at this time. NCCS will continue to monitor this and keep you updated as the model rolls out. 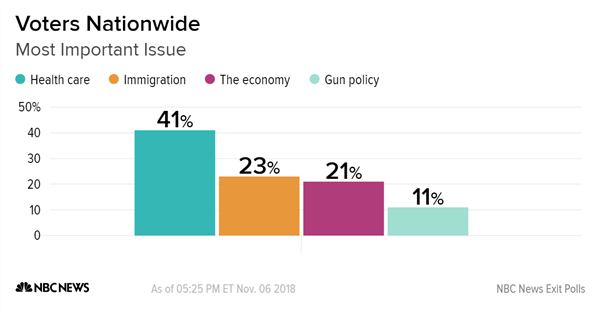 Exit polls on Tuesday showed that health care was the most important issue to voters in the midterm elections. Midterms put the brakes on Republicans’ health care agenda—so what’s next? We saw candidates on both sides of the aisle campaign on protecting pre-existing conditions because health care and the ACA came in as the number one issue for voters in this election. Now that Democrats have control of the House, the ACA is no longer at threat of repeal by Congress. Axios provides a great overview of the election results and their impact on health care. In addition, they make predictions for the new Congress including a heavy dose of health care investigations and hearings, focused on regulations and waivers that undermine the ACA and Medicaid. Now that short-term health insurance policies, or junk plans, are available for consumers, it is important to know that these plans are not ACA-compliant and do not cover pre-existing conditions, essential health benefits, or other important patient protections. Kaiser Family Foundation shares a fact sheet on these short-term plans.